Did you think we had forgotten? So, last night I got a wild bug in the backside, and decided that I was tired of staring at some blank achievements. You may remember several months back that I had made a post about starting loremaster. I was determined, my jaw was set, and I decided I was going to make Outlands wish it hadn’t trifled with me all those months ago. There.. you see all of those time-stamps for when I did the achievements? That’s right. I did 5 zones in about 12 hours.. give or take. Now, to be fair I was about 1/3 done with Shadowmoon Valley, something like 52 quests into Nagrand, and (i think) 40 quests into Netherstorm. I had a big fat goose egg in Blade’s Edge, and *man* was that place ever painful. It started off well enough, but the reservoir dried up as I closed in on the end of it. I had to finish my last 7-8 quests doing Ogri’la quests. Now, dailies don’t count towards loremastering zones, but when you FIRST do the quest and it’s a yellow exclamation mark, then it WILL count. Lucky for me, because I would’ve been pounding my head on the desk by now if I had to find those quests from other places. Now, this shows what I have left in Northrend. 6 zones may sound like a lot, but let me break down what I have from levelling Fuzz up a couple years back. I have 84/115 quests in Dragonblight, 12/85 in Grizzly Hills, 21/100 in Zul’Drek, 62/100 in Storm Peaks, 59/140 in Icecrown, and another goose egg waiting for me in Howling Fjord. I’ve never really cared much for Howling Fjord. I went through a few quests there once, way back when Wrath launched, on my mage, but it was meh. I like efficient levelling, and Borean Tundra seemed like the more efficient route. I’ve had several people tell me they prefer HF, and I may find that my first impression was wrong, so we’ll see. I am, a little bit, looking forward to getting in and REALLY delving into that quest lines. Icecrown isn’t overly terrible, but it’s a REALLY big zone, and there was LOTS of group quests in there. I don’t mind group quests at all, but they’ve always kinda bothered me when you have so many of them pigeonholed into one zone. Of course, group quests for a levelling 78-80 toon won’t be a load of squat compared to a raid geared 85, but I know that’s one reason I have always tended to avoid that place. Dragonblight and Storm Peaks are probably not much to worry about. 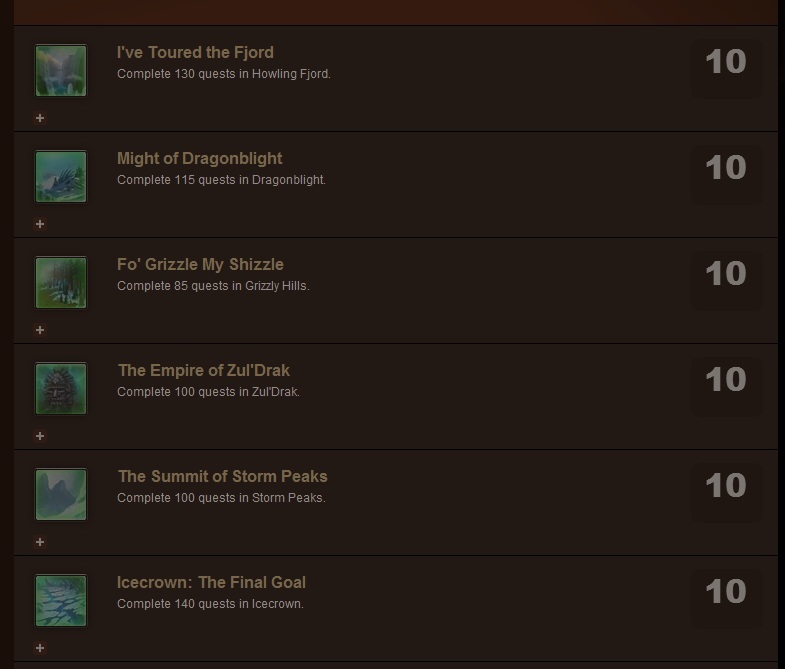 Grizzly Hills and Zul’Drek will take some time, but they have solid breadcrubs, so i’m not worried about them either. All things considered, I have come to the conclusion that people who Loremaster once are out of their frickin minds. It makes you take a look back at the differences between the way questing is done now and how it was done a couple years ago. Go into the pre-level-60 zones, or Northrend or a Cata zone, and everything is so streamlined and pointing you in the right direction. And then you go and do Outlands and it’s like getting punched in the face by 5 year old quest design. Now, don’t misunderstand me. I pretty much hit it right on the head. Burning Crusade *is* 5 years old, and it would’ve cost a LOT of extra man-hours to streamline those zones, especially when Blizzard barely got Cata released on time as it was, given the huge reinventing of pre-60 content. And for MoP, Blizz is focusing more on updating character models/skeletons (which they DESPERATELY need), so we won’t see it for the next expansion either. It makes me kind of wonder whether we’ll EVER see a revamp of the Outlands quests.To be perfectly honest, I wouldn’t hold my breath folks. The only exception would be if there’s another expac that has us going after Sargeras (which would probably be the very last expac for WoW, truth be told), and only then because it’s going to be story-wise relevant content. Illidan and Kil’Jaedan are dead, the Burning Legion have been beaten back TWICE from the brink of turning Azeroth into another planet-shaped-smear on their road map of intergalactic conquest, and a bunch of other stuff has happened that I can’t even think about right now because… well to be perfectly honest, i’ve spent most of the last 14 hours doing fricking Outlands loremaster, and i’m a bit brain addled. Time to go lay down.. oof.